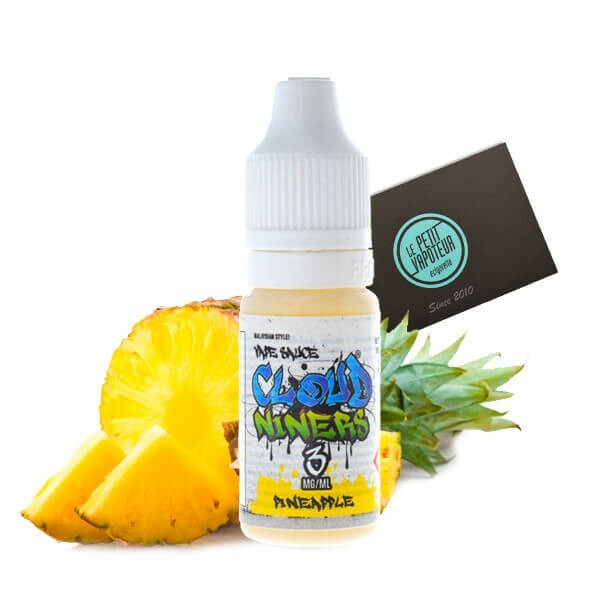 The E-liquid Pineapple from the range Cloud Niners, with flavours of surprising and realistic Pineapple. Find in the mouth sweet, juicy and fresh Pineapple which will tickle you taste buds. The E-liquid Cloud Niners is "served" in a 10ml plastic vial and prepared with a base in 30/70 of Propylene Glycol and Vegetable Glycerine. Cloud Niners, from the Malaysian Manufacturers Vape Sauce is a range of E-liquids originated from Malaysia. Principally fruity, the recipes from Cloud Niners are simply rich in taste. Far from complex E-liquids, the range Cloud Niners dare to present mono flavous which are ultra-realistic. Without any doubt a new reference for amateurs of taste. Cloud Niners have chosen a mixture with a proportion of 30% in Propylene Glycol and 70% in Vegetable Glycerine for maximum of vapor. Made in Malaysia by Vape Sauce. Ananas très goûtu et sucré !